This season at Pisamonas, we have these girls' angel-style Mary Janes. They have a patterned bow with a natural spring print that you and your little one are sure to love. These canvas Mary Janes are really cool and lightweight, perfect for the hot months. Your little girl will have her feet well protected in these highly breathable shoes that can be worn with or without socks. The bow is also removable; it can easily be attached for smart occasions where you want your daughter to wear her Mary Janes with the bow, or removed to make for a neutral style on more casual days. Two high-quality Mary Janes in one, and at the best price! 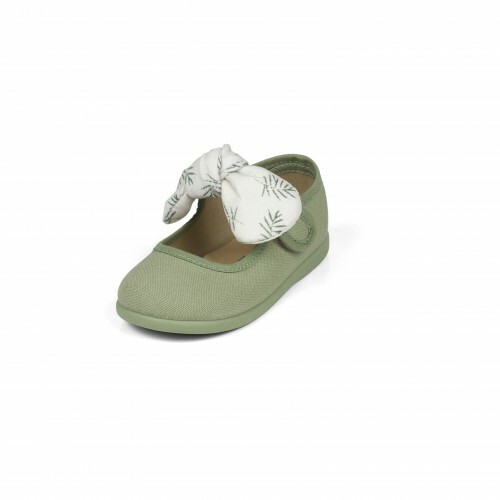 Available in green or beige with an ecru bow with a green twig print. These shoes come in sizes 19 to 26. The ideal pair to ensure your little ones feel comfortable and safe with every little step they take! 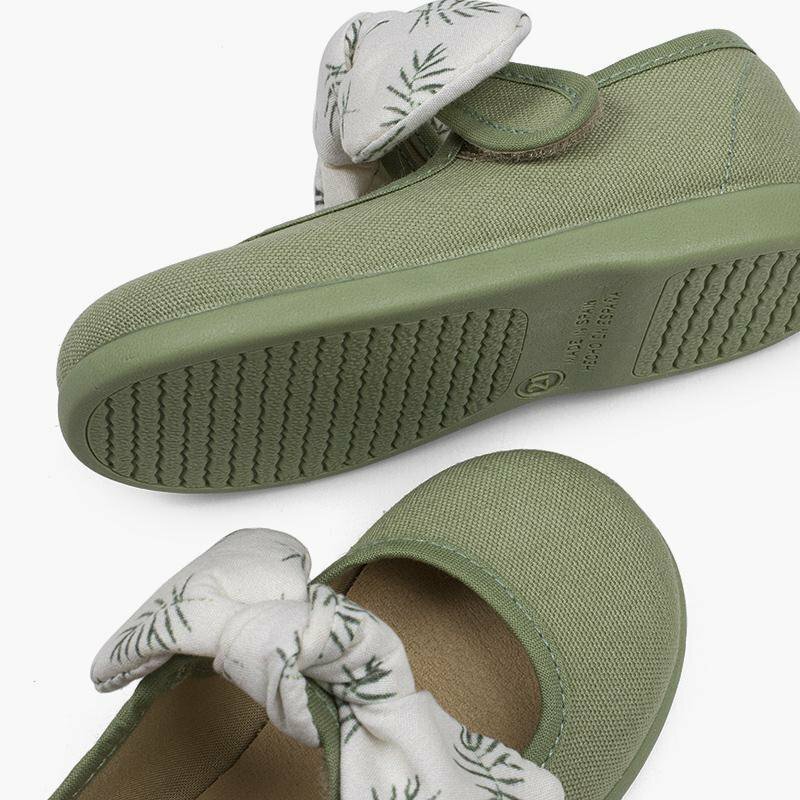 These Mary Janes also have a simple Velcro closure so yours kids can put them on and take them off all by themselves, which encourages their independence. Like all our products, these girls' canvas Mary Janes have been manufactured entirely in Spain and have all the guarantees from Pisamonas - your trusted online shoe store. As always, shipping, exchanges and returns are free! It all depends on the day! 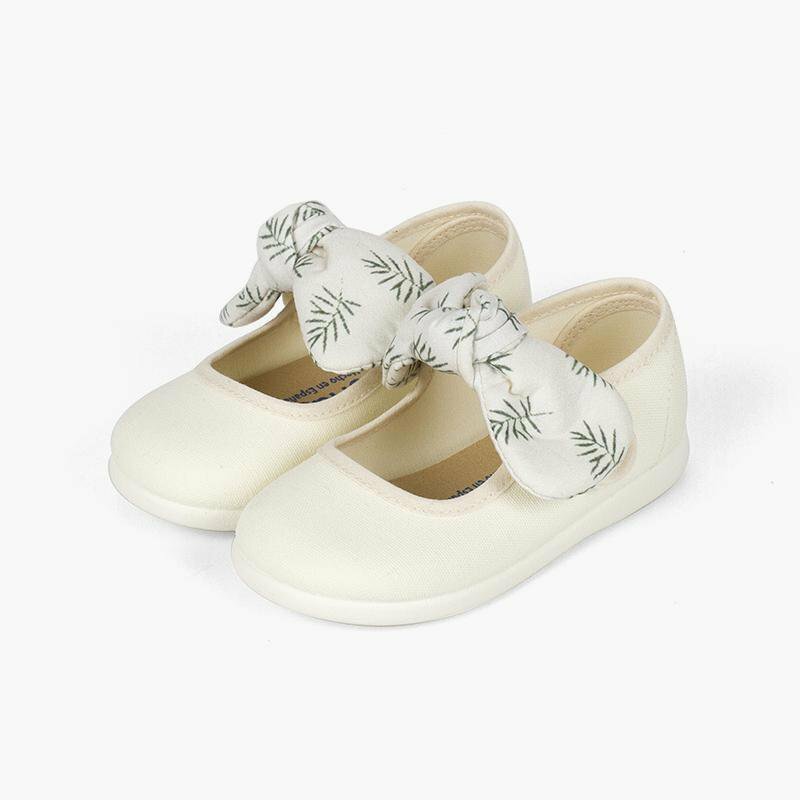 Without the bow, you have a classical and simple Mary Jane, The bows printed with green palm tree give a fresh touch of originality to brighten up your little girl’s outfit! Whether green with a cream-coloured bow, or beige with tha cream bow, the neutral colours go with anything and are a lovely fresh and eco-friendly tone for spring!